Want to be good to your liver? 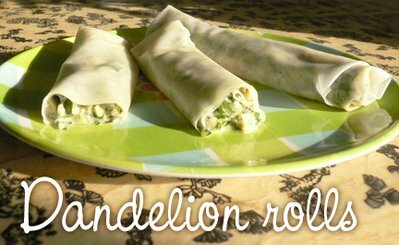 Dandelion is an excellent and very potent bitter herb, so if you can find some fresh dandelion leaves in your grocery store, add it to your diet like you would using spinach. That said, if you can't find dandelion you can substitute spinach, chard, beet greens, or any dark leafy greens of your choice. Pour boiling water into a large, shallow dinner plate. Place rice paper, one sheet at a time, until fully submerged. Allow to soften (a few minutes). Blend tahini, lemon juice, Bragg's or salt, garlic and ginger until creamy smooth. Stir in dandelion greens and nuts or seeds until well mixed. Take a softened rice sheet, let drip dry a little, then place on a surface. Spoon half of the dandelion mixture onto the center of the sheet in a long log shape. Fold the short sides over the ends of the log, then fold one half-circle over the log, then start rolling towards the remaining half-circle. Repeat with the second sheet and remaining dandelion mixture. Makes 2.